That designation filled Brian Evans, a Canadian Sinologist and the embassy’s cultural officer, with unbridled joy. He immediately lobbied for and won the job. There was only one problem: No one at the Chinese Foreign Office knew how to translate beaver. We were at an impasse, the sort on which the very history of the world turns. You’ll have to read Evans’ autobiography Pursuing China: Memoir of a Beaver Liaison Officer to learn whether Trudeau’s beaver diplomacy survived translation. Trust us, it’s worth it. From start to finish, Evans weaves insights on China-Canada relations with a charming account of his lifelong fascination with China, an unlikely pursuit that began in the Great Depression at a Chinese-owned restaurant in rural Alberta. We were lucky enough to correspond with Professor Evans in his later years, when we asked him to comment on some intriguing passages from his book (excerpted below in italics) about his seven decades eating Chinese food. After completing a three-year degree at the University of Alberta, Evans enrolled in London’s prestigious School of Oriental and African Studies (SOAS), where he cooked char siu with a classmate who became the influential chef and cookbook author Yan-Kit Martin. Mrs. How joined her husband ... in Taber in 1923, the year the Exclusion Act went into force, banning any further immigration of Chinese women (and Chinese men who were not merchants) to Canada ... She taught me how to use chopsticks and fed me authentic Chinese food. TCQ: How vivid are your memories of those first foods? Brian Evans My first experience of Chinese food (prepared in the kitchen of the Cameo Cafe by Herbert’s mother) remains with me visually more than gastronomically. It was a simple stir-fry of chicken, celery, onion, and tomato served with steamed rice. I remember the hot rice in particular because up to then I had had rice only in my mother’s rice puddings; it was never served to accompany main dishes. Later I developed a taste for the Cameo’s chop suey and chow mein – enhanced, of course, by soya sauce. Those tastes and flavours remain with me today and are sometimes recaptured in small-town Chinese cafes. [When my family dined out,] the ritual was always the same ... Just before noon, we would gather at a Chinese restaurant to eat soup, halibut with mashed potatoes, and coleslaw, ending with pie and ice cream. Are those dishes typical of the Prairie Chinese you grew up with? BE My parents never ate Chinese food, but being British, they loved fish. On the occasional trips we made to the city of Lethbridge for shopping and an excursion, we had lunch in a Chinese restaurant on the main street. Typically, it – and other Chinese restaurants – offered a menu including fish, veal cutlets, pork chops, steak, and chicken, along with mashed potatoes, peas and carrots. For dessert, there were usually at least three sorts of pie: apple, raisin, coconut cream, along with vanilla ice cream. This type of Western menu was fairly standard in Chinese restaurants on the Canadian Prairies until the arrival of fast food. Yan-kit ... very much took to life in London, except for its lack of good Chinese food. At that time there were only two Chinese restaurants in Central London, each of them too expensive for students .... In desperation, Yan-kit would come to our cold-water flat in Onslow Gardens to cook barbecue pork (char hsiu), which we dubbed Charles Liu. Did you keep in contact with Yan-kit Martin? Did your paths ever cross again over a meal? BE Yan-kit went on to become a famous TV chef in England and wrote two fine books on Chinese cooking. She died from cancer on 22 December 2002, aged 68. A cooking scholarship was established in her name. As a student she was inordinately fond of steak. Our last meal together, so many years ago, was of steak in a small hotel restaurant on Drury Lane near the Winter Garden (now the New London) theatre. After completing his PhD, Evans signed on as a University of Alberta history professor and made his first visit to China in 1964 as a tourist. Subsequent research trips were engulfed by social upheavals; a few years after that initial foray, he dodged the Cultural Revolution by hopping the Trans-Siberian Railway to Moscow. Evolving China-Canada relations in the late ‘60s and early ‘70s opened new opportunities for China specialists. In the twilight of the Mao era, Evans took up a diplomatic posting in Beijing. Once the initial novelty wore off, the city could be a lonely and grim place for foreigners, the only diversions being dinner parties and official receptions. Standing by the tracks [in Siberia] were bulky women dressed in black dresses with white aprons. They sold foods such as boiled eggs, cabbage, potatoes, and garlic. These were scenes quite different from the train stations I had seen in China where a range of foodstuffs were dispensed off carts. What did the food carts at Chinese train stations offer in the ‘60s? BE At train stops from Canton to Peking in the late spring of 1964, there were carts with steamed dumplings, steamed bread, hard-boiled eggs, a few apples, hard candies and peanuts, as I recall. Western restaurants were very few in number, and only two in easy reach for embassy staff. The special Friendship Store, an oasis for foreigners .... also sold some Western foodstuffs, but most members of the embassy depended on shipments from Hong Kong or Europe. What international food was available in Beijing then? BE At that time, the hotels catering to foreigners were, to my knowledge, the only places offering something other than Chinese food. By the early 1970s the International Club offered Western dishes and later, to everyone’s delight, the Minorities Hotel offered Italian food. Things began to change following Mao’s death, as a few private cafes began to broaden the range of food offered. Otherwise, the homes of foreigners remained a source of non-Chinese food for those lucky enough to be invited. A major handicap was the shortage of foreign foods available commercially. The Friendship Store stocked Chinese fruit and vegetables (i.e. cabbage) on a seasonal and intermittent basis. There was always a run on Chinese-made cheese when it was stocked and most fell in love with the yogurt, which was in ready supply. Otherwise, the Friendship Store carried Chinese wine and liquor (the champagne tasted a little like Asti Spumante). Chinese restaurants that were open to Westerners were greatly in need of repair and redecoration. Those patrons with nervous stomachs had only to hear the cook clearing his throat of Beijing dust to hesitate about consuming the food. Did you have a nervous stomach in China? BE I have very boring mainline chicken, fish, duck, pork, and beef tastes. I have never been able to digest lamb or rabbit and I have avoided donkey and horse. (I found Siberian horse to be tough and uninteresting.) My first encounter with sea cucumber caused an initial stomach flutter and nowadays, having nearly choked to death on a fish bone in Chongqing in 2008, I am a little fish-shy. I have found snake acceptable; the same with the odd insect dish I’ve had. I am not that keen on moose nose or bear’s paw, despite the tasty sauces. In short, I could never be a qualified Guangdong gourmet. As much as I like Chinese food, I have always been nervous about being the guest of honour and the responsibilities that go with it. What was your strangest experience at a Chinese banquet? 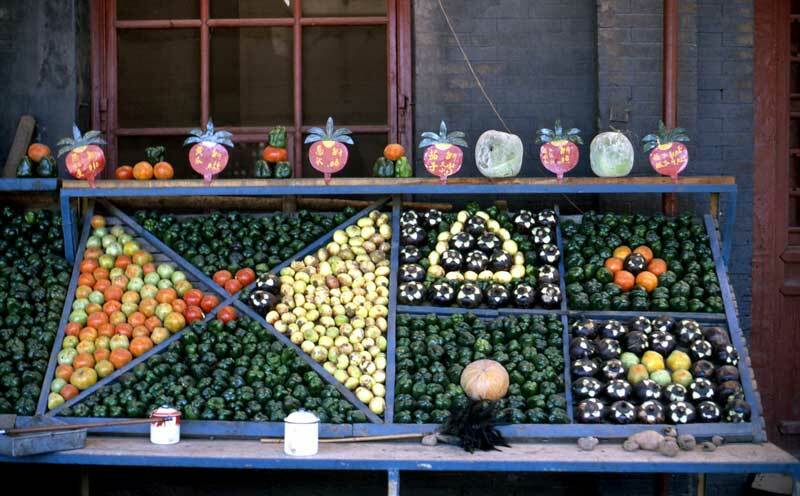 Vegetables on display in a Beijing hutong, 1978. Back in Moscow, I was heartened to see Russian-Chinese relations had improved to the point that the lone Chinese restaurant had reopened, featuring Peking duck flown in daily from Beijing. Unlike the roast duck restaurants in Beijing, however, the Moscow establishment featured belly dancing. BE During a visit to Moscow as a visiting scholar in the fall of 1978, I asked to visit Moscow’s only Chinese restaurant, which was named Peking. I was told it was closed. This was not surprising because it had a poor reputation. It lacked the materials to produce Chinese food, although it sported coloured photos of the dishes it could not provide. Diners were advised to bring their own soya sauce. Following the warming of Sino-Soviet relations beginning in 1989, the Peking reopened, serving Peking duck. As a member of an official delegation in 1991, I suggested we try it. We were told that ducks were flown in daily from Beijing. The duck was good once it arrived, but it was not served with the same panache as in Beijing. To our surprise, belly dancers appeared, apparently to cover for slow service. The restaurant was fairly crowded and no one, as I remember, was packing soya sauce. Friends who visited Moscow later were disappointed not to be provided with similar entertainment with their duck. Perhaps it was just an early effort to gain new customers and recapture its former ones. I make it a practice, no matter where I am in the world, of seeking out a local Chinese restaurant. I fear that not all countries are well served and, like Prairie Chinese chefs, cooks have adapted their menus to suit local, non-Chinese tastes. Can you tell us more about the Chinese cooking you’ve experienced around the world? BE I seek out Chinese food when I travel and have eaten it in Cape Town, Nairobi, Prague, Paris, London, Addis Ababa, Rome, Padua, Bangkok, Havana, Moscow, and various cities in the USA. If I am able to make known that I have eaten Chinese food before, notably in China, the chef will produce good off-the-menu dishes; this is because most chefs are of Chinese ethnic origin. Unfortunately, in Nairobi, the Chinese chefs who had been sent to train the local cooks had already left and the dishes – chunky and not properly cut – had a distinctive African flavour. The restaurant in Cape Town was run by a Chinese family from Mauritius, none of whom had ever been close to China. The restaurants in Prague and Padua were little jewels of decor and porcelain. The food was good but of limited range. Havana’s Chinatown consists of one short block of cafes mostly selling noodles. Doormen dressed in court robes try to lure one in. They look Chinese but seem to be unfamiliar with the language. The story is that many of the Chinese entrepreneurs fled to California when Castro came in. Whatever the case, the food in Havana lacked zip. The last chapter of Pursuing China opens with a soliloquy on Chinese cuisine, from the Prairie Chinese of Evans’ childhood to the glitzy mainland food temples of today and everything in between. [As a boy] my taste buds grew accustomed to chow mein, chop suey, lemon chicken, sweet and sour pork, egg foo yung, wonton soup, spring rolls, fried rice, and fortune cookies, common fare on the menus of Prairie cafes. Do you still eat any of these Prairie Chinese dishes regularly? BE Thanks to immigration, I have access to excellent Chinese food here in the city of Edmonton, whose citizens, drawn from over five dozen nations, have developed a preference for authentic cuisines. Very few of the Chinese restaurants here serve Westernized dishes because the clientele for such cuisine is limited mainly to older patrons who grew up with that style of dishes. One dish I do indulge in is a recent Western addition called Szechwan Beef, whose origins have been traced to Calgary, Alberta. It consists of thin strips of candied beef drenched in a sweet garlic/chilli sauce. I much prefer the unsweetened Chinese original, but this variation is good comfort food. I have a close friend who is addicted to lemon chicken, but he is excused because he is a physicist. I am never happier than when I am in a Chinese restaurant. BE The highlight of my week is early Sunday morning dim sum, beginning with a large bowl of congee. It is a bad week when I have less than four Chinese meals out, apart from what I prepare at home. I live two blocks from an excellent restaurant whose new chef has brought a taste of authentic Beijing to the menu. My appetite for Chinese food remains unblunted. If there is a religion that guarantees a heaven full of Chinese restaurants, I might consider becoming a convert. What might the tenets of this religion be? BE As an agnostic, I might be persuaded to convert to a religion that placed emphasis on humour, universal friendship, cooperation, and for which morning dim sum was a ritual. Once one abandoned this life, he/she would be carried upward in a bamboo basket, rising on a column of steam to a place where all deceased famous Chinese chefs presided over an endless buffet of fresh dishes, exquisitely prepared. I might even volunteer for the priesthood.